If you’re tired of traffic and the suburbs, you will love your visit to Old Town. Come enjoy a wonderful meal on the Walking Mall; eat at an outdoor cafe and watch people stroll by or dine in a sumptuous dining room with a crackling fire. No matter the season or your dining preference, Old Town Winchester has something for you. And after your meal, visit our unique shops, enjoy a drink or an ice cream cone, stroll down shady streets, and enjoy the feeling of nostalgia here. It’s like coming home. Don’t miss: Handley Library, the George Washington Hotel, Mt. Hebron Cemetery. Come for a Special Event: First Fridays Celebration of the Arts, FIRST Friday of every month, except January and May; First Night Winchester – New Years Eve annually; Shenandoah Apple Blossom Festival – annually each May; Wine & Fine Art Festival – annually each May. Check out our Downtown Guide for a quick glance at shops, parking, and more. Come cool off at our new Splash Pad located on the south end of the Pedestrian mall. The public restroom’s hours are Monday through Thursday from 8am to 9pm, Friday and Saturday from 8am to 11pm, and Sunday from 10am to 9pm. Many businesses in Old Town Winchester offer discounts to students of Shenandoah University and Lord Fairfax Community College. Click here for a full list of participating businesses. 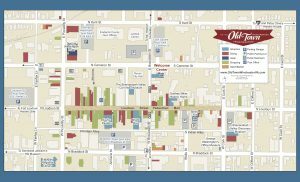 Get a quick overview of downtown’s layout with this Old Town Winchester Map.